Freshly squeezed juices and fruit salads are on offer at every street corner in Mexico, as a quick refreshment for passers-by. These are offered with a choice of the sugar shaker or a sprinkle of chilli, with or without salt (in a tropical climate, replacing salt lost through perspiration is a necessity). In this sophisticated version of everyday street food, a chilli-infused syrup is used to dress a mango, papaya and banana salad, whose soft flavours are sharpened by a pineapple sorbet. Make the chilli syrup: bring the sugar and water to the boil in a pan, then simmer, stirring, for 5 minutes or till the sugar is dissolved and the syrup thickens a little. Add the chilli; set aside to infuse. To make the sorbet, purée the pineapple with the lime juice in a liquidiser. Press through a sieve to remove any fibres. Add water to make the mixture up to 600ml, then add sugar to taste (be generous, it will taste less sweet when frozen). If you're using an ice-cream maker, whisk the egg white into the pineapple mix and churn according to instructions. Otherwise, tip the pineapple mix into a plastic container and put in the freezer. Remove when ice crystals have formed (3-4 hours) and whiz with the egg white in a processor before refreezing until solid. To make the brittle, lay a sheet of baking paper over a baking tray. Toast the sesame seeds in a dry frying pan over a medium heat until golden. Dissolve the sugar in the water over a gentle heat then boil for 5 minutes or until it forms a golden caramel. Mix in the sesame seeds. Pour on to the baking paper. Leave to set then break into pieces. Prepare the fruit salad just before serving. Slice both 'cheeks' off each of the mango. Cut the flesh into cubes without going through the skin, and run the blade down the inside of the skin to release the cubes. Peel and chop the remaining flesh from the mangoes. Peel, deseed and dice the papayas. Peel and slice the bananas. Remove the chilli from the syrup, deseed it and slice finely. Combine the fruits and dress with the chilli syrup. 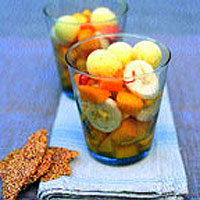 Spoon the fruit salad into glasses and top with a dollop of pineapple sorbet and a chilli ring. Serve with sesame brittle.